Russia will undock its ISS Progress 58 spacecraft Friday morning for a fiery atmospheric entry over the Pacific Ocean. Japan will launch its fifth “Kounotori” HTV cargo ship (HTV-5) Sunday morning from the Tanegashima Space Center. New astronauts Kjell Lindgren and Kimiya Yui trained for next week’s arrival of the HTV-5. They will be in the cupola to capture the HTV-5 with the Canadarm2 and berth it to the Harmony node Thursday morning. Earlier, cosmonaut Oleg Kononenko joined Yui to set up free-floating SPHERES microsatellites for a competition that introduces students to programming vehicles to fly in space. 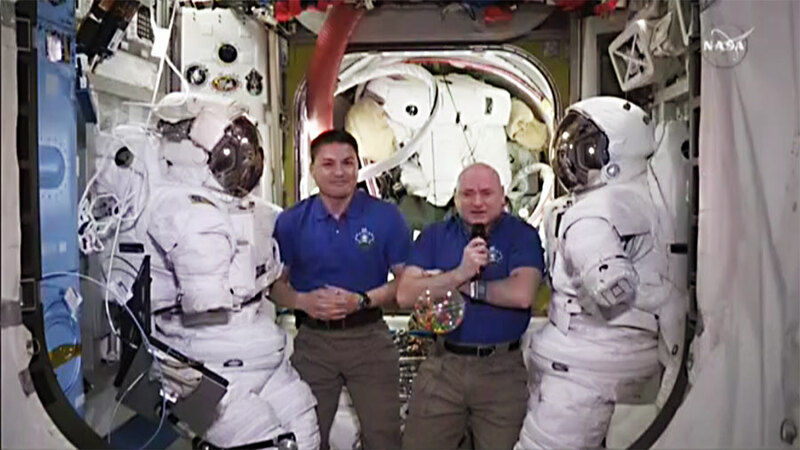 One-Year Crew member Scott Kelly worked on plumbing tasks in the station’s Water Recovery System. Cosmonauts Gennady Padalka and Mikhail Kornienko are still cleaning up after Monday’s spacewalk. They stowed the tools and hardware used to rig new equipment and photograph the external condition of the station’s Russian segment. I believe I saw the two crafts from my house in Maine tonight . I often see the space station go by in its orbit .